Newcastle United registered a vital win at home to Cardiff City on Saturday, courtesy of two goals from the unlikely source of Switzerland international defender Fabian Schär and a late strike from Ayoze Pérez. Other than a half-hearted appeal from Pérez for a penalty, the hosts had very little in the way of chances until defender Schär went on a mazy solo run before firing the ball past Neil Etheridge with his weaker left foot. Schär doubled his tally for the game with an instinctive finish following a corner which was flicked on at the near post, leaving Cardiff goalkeeper Etheridge helpless to stop his side from going two goals behind. The icing was put on the cake when Salomón Rondón unselfishly put the ball on a plate for Pérez to crown a commanding performance at St. James Park, helping them climb five points clear of the relegation zone. Newcastle United weren't at their best on Saturday but the Magpies never looked threatened by Cardiff City throughout the game. Rafa Benitez's back three had more than enough quality to starve Cardiff's attackers of any real chances, while Isaac Hayden and Sean Longstaff bossed the middle of the park despite being outnumbered by the Bluebirds' three-man midfield. 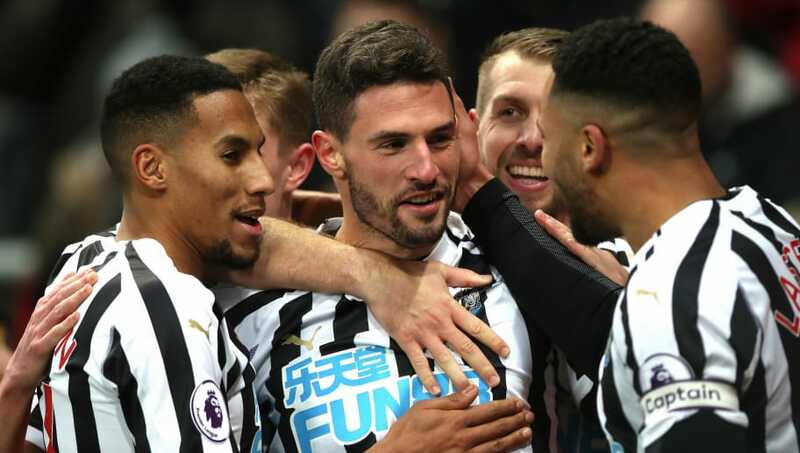 It was vital for Newcastle to get three points by any means necessary and despite being short of ideas in the final third, Fabian Schär found himself in the right place at the right time to score his first ever Newcastle goal(s). Starting XI: Dúbravka (6); Yedlin (7), Schär (10*), Lascelles (7), Lejeune (7), Ritchie (8); Pérez (8), Hayden (6) Longstaff (6) Atsu (6); Rondón (8). While Salomón Rondón deserves a special mention thanks to a stunning piece of sportsmanship, Fabian Schär had the game of his life to almost single-handedly give Newcastle United a much-needed win. Not since Hatem Ben Arfa have we seen a goal like that at SJP. NUFC defender Fabian Schar runs from near enough halfway line before curling into bottom corner from 12 yards. 1-0. Not sure what will annoy Neil Warnock more - that his side are 2-0 down or that both goals were scored by notorious European Fabian Schar. The Swiss defender was flawless at the back and even intercepted a pass from Bobby Reid which would have given Callum Paterson an open goal, but he's making the headlines for scoring a brace - including a Lionel Messi-esque solo effort - to open his account with the Magpies. Neither Isaac Hayden or Sean Longstaff were really put through their paces and it showed in their performances on Saturday. While neither midfielder put a foot wrong, they didn't take the game by the scruff of its neck like fans would have hoped. Anyone who doesn't believe in looking at stats might be onto something, because Cardiff City's one shot on target at St. James' Park flatters them tremendously. FFS. Have we actually scored a goal yet in 2019?? Utter garbage yet again. The Bluebirds couldn't come close to matching Rafa Benitez's side and, although defender Fabian Schär was Newcastle's only source of goals until added time, it looked like it was just a matter of time before the hosts secured the win from the first minute right through to the last. Starting XI: Etheridge (7); Peltier (6), Ecuele Manga (5), Bamba (7), Bennett (6); Mendez-Laing (5), Camarasa (6), Ralls (6), Hoilett (4); Paterson (5), Niasse (5). Substitutes: Reid (6), Murphy (6), Ward (N/A). Not for the first time, Cardiff City have goalkeeper Neil Etheridge to thank for keeping the scoreline down during a defeat, although the Philippines international was helpless to keep either of Fabian Schär's shots either side of half time or Ayoze Pérez's late goal. He commanded his penalty area well, but the 28-year-old wasn't helped out by his back four and was forced to come and deal with crosses into the box when Newcastle players were allowed to swing the ball in without a challenge. No one in the whole Cardiff squad will be making that long journey back to south Wales with their heads held high, but few players will be as disappointed as the incredibly talented - but horribly inconsistent - Junior Hoilett. He created almost no real chances throughout the game and when the odd half chance came his way, Hoilett was extremely wasteful. His performance and lack of creativity also had a knock-on effect which weakened Callum Paterson and Oumar Niasse's hopes of making a difference. Newcastle United will look to make it three wins from three across all competitions when they take on Watford in the FA Cup next weekend, especially as they'll need their confidence if they want to upset Manchester City three days later. Cardiff City, meanwhile, face the tough task of facing Arsenal away from home having registered just two wins since the start of December.